When I was a kid you convince me to do just about anything by bribing me with donuts. Swim practice, sure as long as I get those Dunkin Donuts munchins after. Church, great as long as I am allowed to eat those those Publix glazed donuts they served after. Don’t judge but this may still holds true as an adult. This recipe comes from a cookbook I wrote when I was in the Williams Sonoma Test Kitchen. My colleague Emily wrote it and it is brilliant. I was going to come up with my own but this one is too good and doesn’t need to be changed. I know frying can be scary sometimes so here are some of the tips that I use to make it less scary. 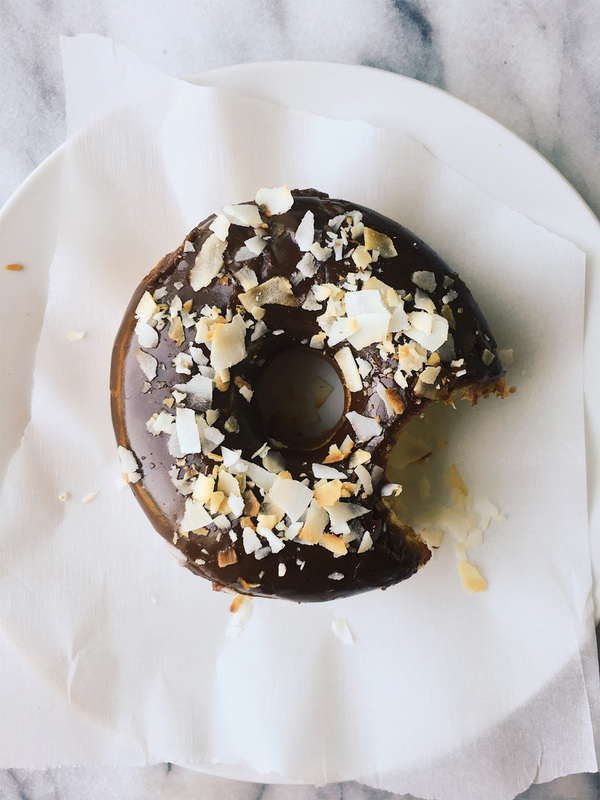 Also I like to dip my donut in chocolate glaze and top with toasted coconut but feel free to use whatever glaze or frosting that you want. I would recommend re-rolling the dough only once to get 8 donuts. If you re-roll the dough any more than that, the dough will get too tough and your donuts won’t be light and fluffy. To the bowl with the proofed yeast, add flour, remaining sugar, salt, egg and oil. Fitted with a dough hook, mix the flour and yeast mixture on low until the dough is smooth and slightly tacky, about 4 to 6 minutes. Remove the dough from the mixer, place on a lightly floured surface and knead a few times by hand. Place dough in a bowl that has been sprayed with non-stick spray and cover with plastic wrap. Let the dough rise for about 1 hour or until doubled in size. Roll the dough 1/2” thick on a lightly floured surface. Using a 3 1/2” cutter, cut out the donuts. Using a 1” cutter, cut out the center of the donut. Place donut on parchment lined baking sheet and allow to proof for about hour or until doubled in size. Carefully remove from Dutch oven and let the donut cool for 10 minutes on a rack. While the donuts cool slightly, make the chocolate glaze. Fill a medium sized pot with 3 inches of water. Bring to a boil over hight heat. Rest a heat safe bowl on top of the pan to create a double boiler. Add the chocolate and butter and allow them to melt. Stir until smooth. Add the powdered sugar, water, vanilla and salt and whisk until smooth. Keep the glaze warm. Dip the donuts in the glaze and sprinkle with toasted coconut. Makes 6 to 8 donuts.